ALIF IMCS (Inventory Management & Costing System) is a specialized System for the Hospitality Industry. Positioned to operate on the cloud or on a local network, the system is good for all sizes of organizations – be it a Small Restaurant, Hotels with Multiple outlets, Banquet Caterers, or Flight Caterers. IMCS System not only takes care of day-to-day inventory requirements but also enables the users to control Costs and avoid stock-outs. There is an Optional Work-Smart Module through which the Organisations Processes can be mapped and the Work Flow can be set. Accordingly, through this method, each user would be prompted on screen of what work is pending for him. Also he can have access to some MIS information, depending on his role in the Organisation. The system has a host of parameters, which can be turned off or on depending on the end user requirements, so that although the same system is installed for all the above industries, the system becomes specific to the requirements of the particular industry. 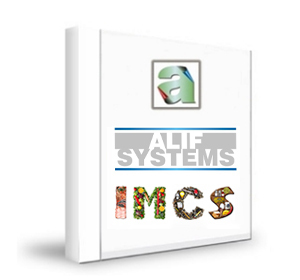 IMCS is totally integrated with ALIF BOSS system. Data captured in IMCS flows directly into Boss thus reducing any manual intervention / batch mode transfers. Thus Bill Booking and Consumption JVs are taken care of directly. Also Debit Notes raised for Rate Contract Violations & Provision Entries for UnBilled GRNs can be done effortlessly. ALIF SYSTEMS have been running in many countries - India, UAE, Sri-Lanka, Nepal, Maldives, UK, etc. Special care is taken to keep the system up-to-date in terms of statutory compliances of the particular countries like VAT, TDS, etc.